A collection of steps and stairs in both Irelands. A poem from Yeats decorate the steps in the Duke of York Pub in Belfast. Wrought-iron staircase in the Crumlin St. Gaol (Jail) in Belfast. Watch out for the ‘Trip Step’ in the ruins of the Carrickfergus Castle near Belfast. 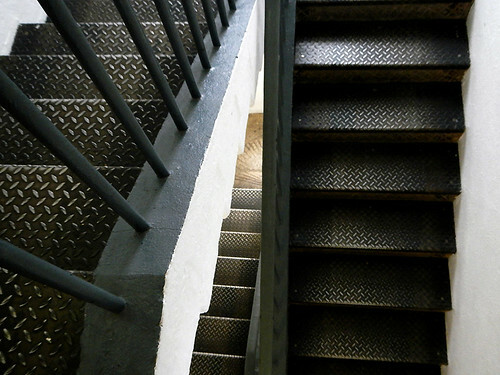 A ‘Trip Step’ is a step that has a much higher riser than the rest of the steps, causing any unwanted intruders to stumble in the dark and awaken the sleeping inhabitants. The rail is a recent addition – it wasn’t there back when the castle was in use. A whole series of ‘trip’ steps on the path to Torr Head, a detour on the Coastal Causeway in Ireland, UK. Steps on an abandoned building, also in Torr Head. 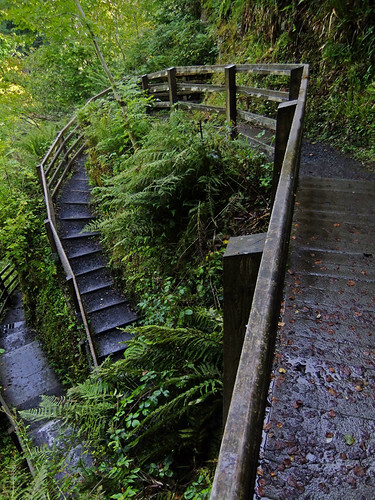 Stairs leading down on our Waterfalls Walk in the Antrim Glens, Ireland, UK. 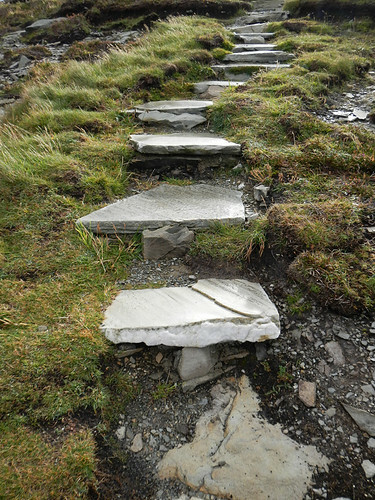 The Republic of Ireland also has some interesting walkways with steps built in, mostly out of rock as that seems to be the primary building material in Ireland. 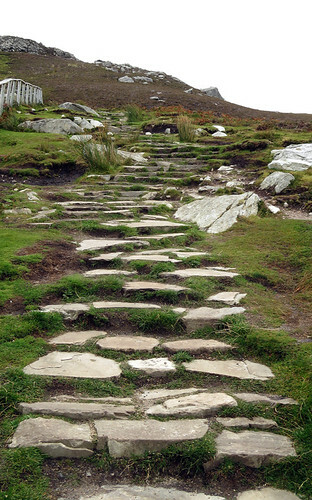 This set of rocky steps lead up a path at Malin Head, the most northerly point in both Irelands. 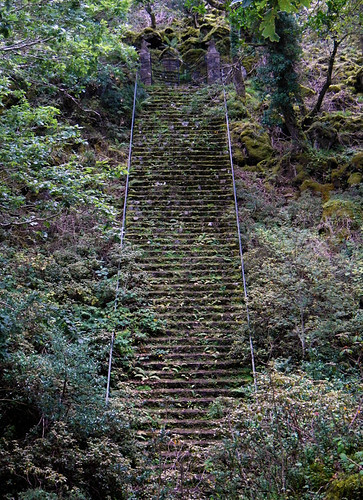 These overgrown stairs lead up to a gate at Glenveagh National Park. 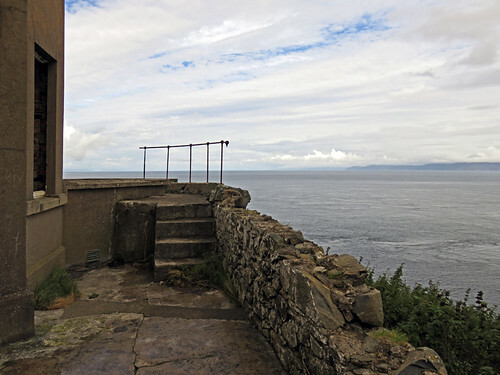 A series of rocky steps lead up the path to a viewpoint at Slieve League in County Sligo. Ireland’s Cliffs of Moher has some daunting stairs on the public trail. 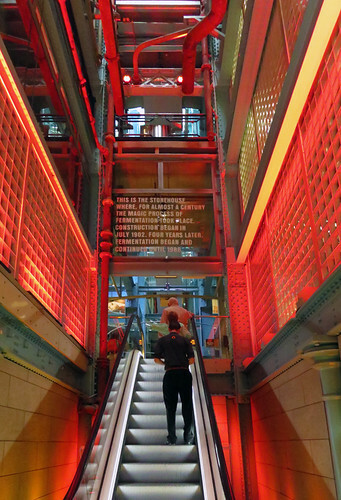 A red escalator leads upwards at the Guinness Storehouse in Dublin, Ireland. On Dublin’s Literary Pub Tour we stop at O’Neill’s with its lit-up stairs. Black metal stairs in Dublin’s Decorative Art Museum. More of Ailsa’s Travel Theme: Steps.